The Festival of the Arts Boca opened the musical portion of its 2017 program Friday night on a high note – actually, a number of high, low, harmonious and heraldic tones. 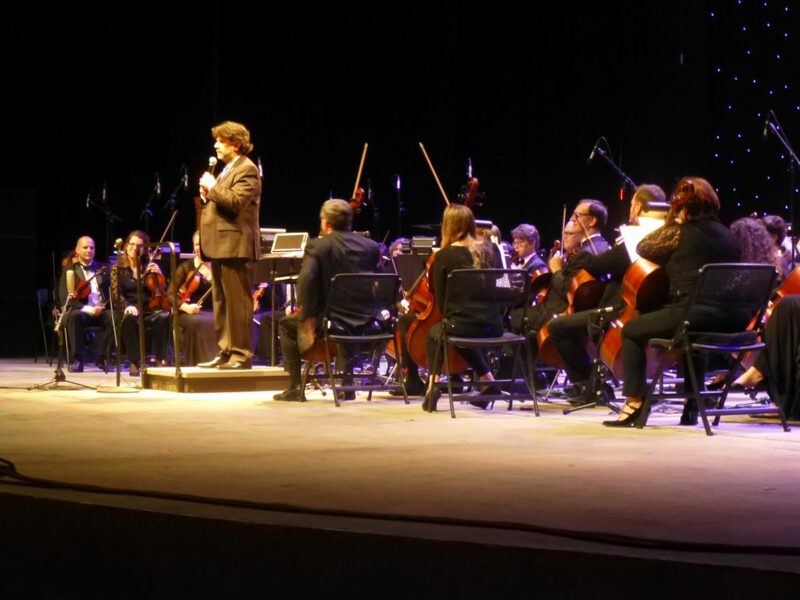 The Symphonia Boca Raton, under the able leadership of conductor Constantine Kitsopoulos, paid tribute to maestro John Williams with a full-on production of tunes from the Harry Potter films and, of course, Star Wars. 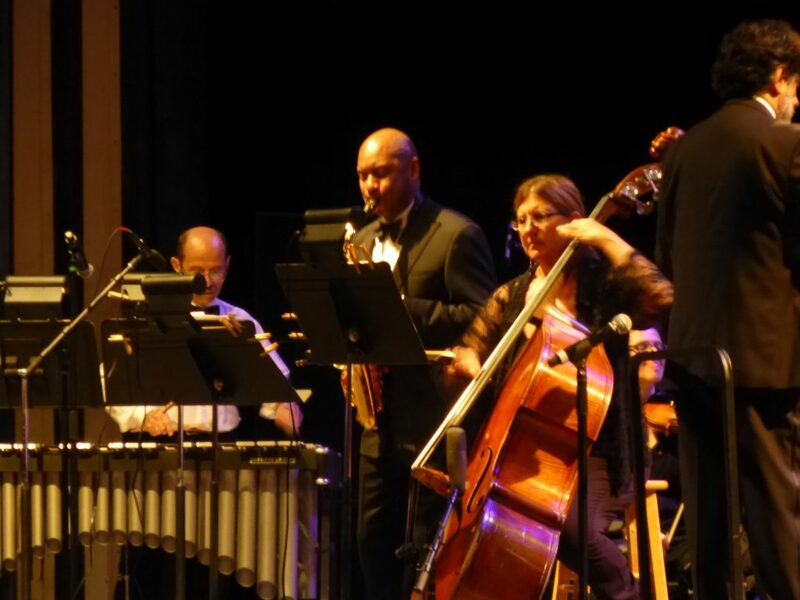 He and the Symphonia were joined by tenor saxophonist Brandford Marsalis on the stage of the Mizner Park Amphitheater. The crowd warmly greeted him as he joined the other musicians. Aside from his multiple Grammy-winning accomplishments in the jazz world, he is well-known to the general public as the musical director of Jay Leno’s Tonight Show, and as host of National Public Radio’s Jazz Set. The show weathered some meteorological mockery Friday night that may have cut down on the crowd. Daytime threatened with heavy clouds and a distinct feel of rain. At night, fierce winds were constant, and shook the temporary roof of the Plaza Real venue, but the musicians were protected by the amphitheater shell. In truth, the place was at least two-thirds full, and, several times, some or all of the crowd stood to applaud the onstage performances. The Symphonia didn’t wait until the Star Wars finale to call upon the trumpets and drums to add some heft to the music. The orchestra opened with a stellar performance of Elmer Bernstein’s theme from The Magnificent Seven. He also noted that Blake Edwards’ 1964 film, The Pink Panther, would be shown in the amphitheater on Saturday, March 11, with the sound track performed live by the Henry Mancini Institute Orchestra, based at the University of Miami. It was Mancini himself who scored the film that introduced Peter Sellers’s bumbling Inspector Clouseau in a series of Pink Panther films. Kitsopoulos noted that the pianist in the orchestra that performed the Pink Panther soundtrack was a youngster named Johnny Williams, who would later be known as John Williams, probably the most celebrated film composer in history, with memorable scores including the soundtracks for Jaws, Jurassic Park, the Star Wars, Indiana Jones and Harry Potter films, E.T. and Schindler’s List, among many others. 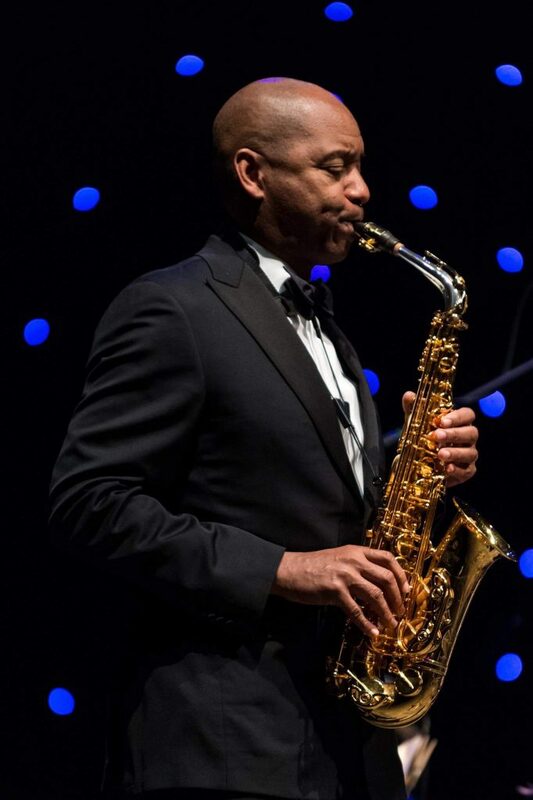 Marsalis, a New Orleans native and oldest son of pianist and educator Ellis and brother of musical siblings Wynton, Delfeayo and Jason, also offered a nod to Williams. He opened the second half of the concert with Escapades, a suite for saxophone and orchestra using music from Williams’s score for the 2002 film, Catch Me If You Can. He was joined by Susan Dirgins-Friend on bass and Mikhail Mikhelson on vibes. The audience seemed truly taken by this trio, more so than Marsalis’s opening work Under the Wing of the Rock, a saxophone concerto written for him by the British composer Sally Beamish. While interesting and certainly well-played, it didn’t seem to tax the skills of either soloist or the Symphonia. No slouch in the theatrics department himself, Marsalis has provided music for The Mountaintop, starring Samuel L. Jackson and Angela Bassett, and served as musical curator for the 2014 revival of A Raisin in the Sun. And he was responsible for the original music in Spike Lee’s movie about a jazz soloist, Mo’ Better Blues. In the long run, the five-piece set from Star Wars that wrapped up the show – including the opening theme and Darth’s Vader’s forbidding “Imperial March” – riveted the audience. At times during the rendition, Kitsopoulos waved his baton as if it were a light saber. Before the music was over, audience members were on their feet, clapping and whistling for more, in tones that rocked the place — as did the orchestra’s stirring performance.